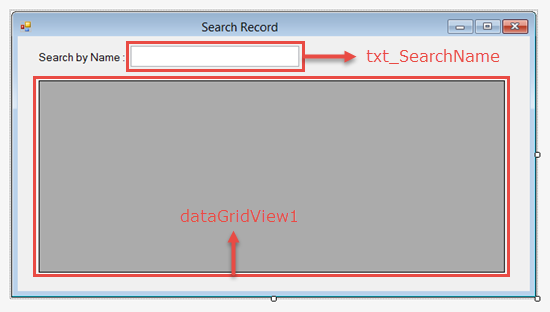 In this Article, we will learn How to Search Record in DataGridView in C# Windows Form Application. In previous post, we saw How to Insert, Update and Delete Record in DataGridView C#. 1. 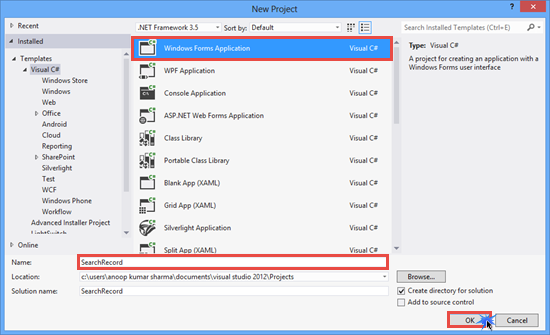 Create a new Windows Form Application. 2. Create Database (named as Sample). Add a Table tbl_Employee. The following is the table schema for creating tbl_Employee. 3. Create a form (named as frmSearch) and Drop Label, TextBox and DataGridView control from the ToolBox. Now, go to frmSearch.cs code and add System.Data and System.Data.SqlClient namespace. In the above code, we have created frmSearch_Load Event for Displaying tbl_Employee Data in DataGridView when form loads. txt_SearchName_TextChanged Event fires when the Text of txt_SearchName TextBox changes. Hope you like it. Thanks. Thanks!but how about when were searching an Integer like an ID?